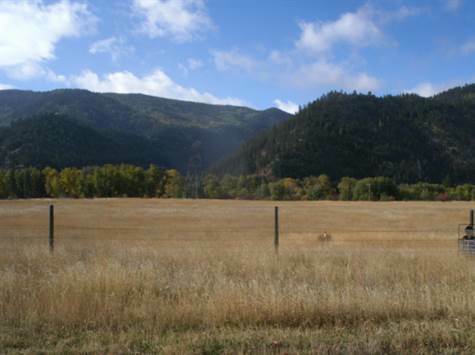 $79,000 GREAT PRIVACY AND VIEW LOTS, 20 MILES OF MISSOULA. NEWLY APPROVED SUBDIVISION. THESE 5 NEW LOTS RANGE FROM 1.3 ACRES TO 2.4 ACRES. EASY ASSESS OFF A PAVED ROAD AND GOOD PROTECTIVE COVENANTS SIMILAR TO THE IMMEDIATE AREA. GENTLY ROLLING LOTS, EACH WITH GOOD BUILDING SITES, THREE WITH DAYLIGHT BASEMENT CAPABILITIES. PROPERTIES OVERLOOK THE FLOOD PLAIN OF THE CLARK FORK RIVER. LOTS ARE LOCATED APPROX 2 MILES WEST OF CLINTON, ON EAST MULLAN ROAD. Directions: Take the Clinton exit, then right across the railroad tracks to the intersection of East Mullan road. Then right again on E. Mullan for approx 2 miles, properties will be on the left side. LARGE SIGNS ARE ALONG THE ROAD AND ALL PINS FOR LOT LINES ARE WELL FLAGGED. RURAL CHARACTER WITHIN 20 MINUTES OF MISSOULA. SEPTIC APPROVAL AND READY TO BUILD. GOOD QUALITY, SIZE, IMPROVEMENTS FOR STICK BUILT IMPROVEMENTS. FUTURE PROTECTIONS FOR OWNERS. 5 LOT SUBDIVISION, NO HOA'S, NATURAL GAS AVAILABLE.